Samuel Lynne Galleries invites you to join us for contemporary sculptor, Michael Kalish’s much anticipated return to Dallas. His exhibition, Greetings from Texas will be a retrospective of his most popular series, along with his new portfolio of 3-dimensional work. Kalish will be in attendance at the opening reception on Saturday, March 30, 2019 from 5-8pm and the exhibition will be on view through May 4, 2019. Greetings from Texas is a kind of “coming home” for Kalish. He has not exhibited work in Dallas in almost eight years, but feels that Dallas is a second home for him. 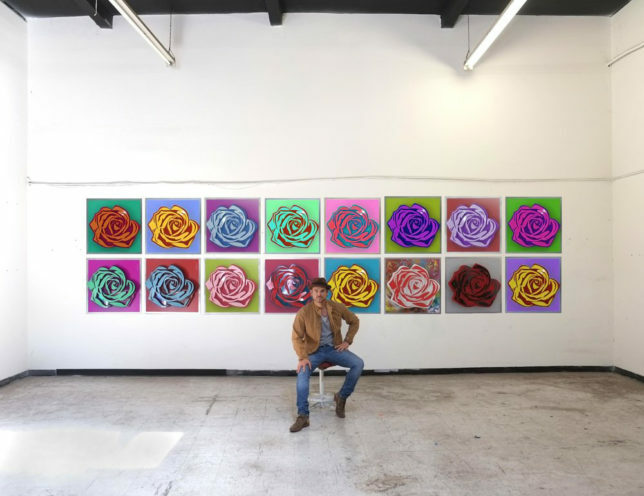 A retrospective in the sense that he will be showing artwork from his older series along with a new body of work, which has been almost five years in the making, combining elements that he has pioneered and perfected. Kalish brings with him some of the most cutting-edge sculptural work, in which he has skillfully implemented advanced technologies to excite viewers, and remain at the forefront of his industry. His 3-dimensional editions, constructed of high-gloss metal layers, playfully interact with audiences, affording unique experiences across vantage points. Kalish’s series of nudes reveal his ability to materialize rigid elements into seemingly delicate forms, stunning spectators with their impressive optical illusions.He is a true creative – constantly crafting ideas for sculptures and figuring out how to get the concepts from his sketches into existence.